Otherwise known as the "LE&N"
Construction of the Lake Erie & Northern Railway commenced in May 1913. The original plan called for the line to be constructed in accordance with the then main line standards for steam operated railways in respect to roadbed, track, bridges and buildings. However, this plan was modified from time to time as construction progressed, no doubt due to the higher costs involved compared to lines built for electric interurban operation. Grading of the line was relatively easy with no serious engineering difficulties being encountered. The only hurdles were the crossing of the Grand River in Brantford, and the Michigan Central and the Toronto, Hamilton & Buffalo Railway's main lines at Waterford. A high multi span overhead bridge was built at Waterford over the MC and TH&B. In October 1914, the Canadian Pacific Railway took over the affairs of the Lake Erie & Northern Railway, or LE&N as it was known, and completed construction. The LE&N operated south from Main Street, Galt, 51 miles distance to Port Dover on Lake Erie. The chief objective of the line was to satisfy a steady growing demand, not only from the manufacturers and commercial interests of the City of Brantford, but from the general public who desired a more direct connection with the main line of the Canadian Pacific Railway, the closest point being either Galt or Ayr. Ultimately, Galt was chosen as the connecting point even though it was 21 miles from Brantford compared to Ayr at 16 miles distance, the reason being the industrial territory beyond and a direct connection with the then Galt, Preston & Hespeler and the Preston and Berlin electric lines. To avoid competition from the Grand Valley Railway, the LE&N purchased the Paris to Galt portion of that line in 1915. Work began in May 1915 to string up electric overhead wire for 1500-volt DC operation. Passenger service between Galt and Brantford commenced on February 7, 1916, with freight service a week later. Service was extended to Simcoe June 2, 1916 and to Port Dover on July 22, 1916. The line terminated at Main Street on the northern boundry of Port Dover. It was not until June 12, 1917 that an agreement with the Grand Trunk Railway was finally approved authorizing joint operation with that company over a half mile section of their track to the passenger station near the lake front. Original rolling stock of the Lake Erie & Northern consisted of four 58 foot wood cars with steel underframe. The passenger cars were numbered 225, 235, 245 and 255; 2 control trailers numbered 265 and 275; and 2 combination express/passenger cars of the same length numbered 209 and 219. These cars were 9 feet 6 inches wide and 13 feet to the top of the trolley board. In 1921 a new numbering system was adopted in which the Lake Erie & Northern equipment would be numbered using odd digits, while the Grand River Railway equipment would be numbered using even digits. The four passengers cars thus became 933, 935, 937 and 939, the two trailer cars became 953 and 955. The combination cars became 733 and 735 for a short time before being renumbered again to 797 and 795 respectively. No further renumbering was carried out during the remaining lifetime of the cars. 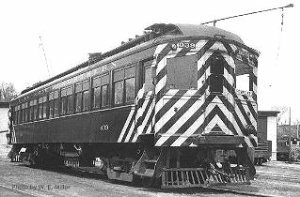 About this time the two trailer cars were converted into motor cars by the addition of motors, with helical gearing, switch groups, resistance, air compressor, compressor governors, and trolley bases. The cars retained their same numbers and could now operate on their own. Two all steel passenger cars, built by the Preston Car & Coach Company in 1921, were the last cars purchased. These cars were identical to the seven all steel passenger cars obtained to re-equip the Grand River Railway when that line switched from 600-volt to 1500-volt operation in December 1921. The new cars were numbered 973 and 975. The area between Brantford and Port Dover is a well-populated agricultural area ideal for growing tobacco, fruits and vegetables. The railway provided a way for these products to be transported to market. The beach at Port Dover generated much passenger traffic in the summer months. Ivey's Greenhouse, and the fact that Port Dover was a fishing port, helped generate express revenue for the line. This traffic would be carried to the Canadian Pacific Railway at Galt where it would be placed on one of the mainline passenger trains for further delivery to its destination. The Lake Erie & Northern Railway and the Grand River Railway, combined, formed the Canadian Pacific Electric Lines with headquarters in Preston, Ontario, Canada. Legally they were two seperate railways but were operated as one under the Canadian Pacific Electric Lines. Following the conversion of the Grand River Railway to 1500-volt DC operation, equipment of both lines was inter-mixed and running crews also worked both. The LE&N had a car barn at Brantford but major work was done at the GRR shops in Preston. Electric "interurban" or "radial" service, as well as freight service, was provided on daily schedules. the cars between open stations. This one was issued May 19, 1949. Passenger service on the Lake Erie & Northern Railway was abandoned April 23, 1955, car 975 making the final run as train 16 from Galt to Port Dover. The Canada Coach Lines Ltd. began a bus service between Galt and Port Dover on Monday April 25, 1955. Following the abandonment, the National Railway Historical Society sponsored two final farewell trips. On a rainy April 24, 1955, the Syracuse Chapter trip was operated with cars GRR 626, 846, LE&N 939 & 937. GRR 862 was added at Brantford due to the number of people boarding there. Believe it or not, the fare for this farewell trip was $3 when paid in advance, $4 on the car. Of note, on the ticket stub was the phrase, 'To enjoy for yet another moment, the romantic saga of flanged wheels, air whistles and trolley wires'. The Buffalo Chapter held their farewell trip one week later, on May 1, the day being warm and sunny. LE&N 937, GRR 848 & 846 made up the original train. On returning to Preston from Waterford, GRR 864 was added to accommodate the crowd. For its freight operations, the Lake Erie & Northern Railway had three electric freight motors, and combined with the Grand River Railway, served some 450 industries along their lines. Two locomotives were acquired to provide freight service at the startup of the line. These two were numbered 50 and 60. During the course of the 1921 re-numbering as explained above, these two locomotives became 335 and 333 respectively. The third and final freight locomotive, purchased for the Lake Erie & Northern, was built in Preston in 1921 jointly by the Preston Car & Coach Company and the Preston Shops of the Grand River Railway. This locomotive was numbered 337. During the course of their lives, all motors would be equipped with MU electrical equipment and it was common to see a Lake Erie and a Grand River motor MU'd. While the Grand River Railway always used the trolley pole to receive power from the overhead wire, the first two Lake Erie & Northern freight motors were originally equipped with pantagraphs and two off-set trolley poles designed to clear the raised pantagraphs. The LE&N wood cars were also designed to have pantagraphs installed but this was never done and those on the two freight motors were removed in favour of a single trolley pole. The Lake Erie & Northern had interchange connections at Galt with the Grand River Railway, the Canadian Pacific Railway, and the Canadian National Railway; at Brantford with the Canadian National Railway and the Toronto, Hamilton and Buffalo Railway; at Waterford with the Michigan Central Railway; and at Simcoe with the Canadian National Railway. Freight schedules provided for over night service between Lake Erie & Northern Railway points, with Windsor, London, Toronto, Hamilton and Montreal. Direct freight connections are also made with C.P.R. trains to and from Pacific and Atlantic Ocean points, and the Canadian Northwest. All train movements on both the Lake Erie & Northern and the Grand River Railways were dispatched in the regular steam road manner from the dispatch office at Preston. Electric freight operation continued until October 1, 1961 when diesels of the Canadian Pacific Railway replaced the electric freight motors. leaving only memories in print, in photographs, and in our minds. A portion of former LE&N right-of-way is now the Cambridge To Paris Rail-Trail. In October 1998 the S C Johnson Paris to Brantford Trail was official opened. "Clang! Clang! Clang! Goes The Trolley"
On Raymond Kennedys Old Time Trains web site. On Robert J. Hughes Ontario Railway History web site.